One of the most talked design changes - or additions - in Windows Vista is Windows Aero. Microsoft calls it a more dynamic user-interface system compared to the basic interface system known from Windows XP. Windows Aero is actually a set of interface enhancements in Windows Vista. One of these is called Windows Aero Glass. Glass adds translucency to all windows of the operating system. This Windows Aero Glass feature is now available in Windows XP thanks to Fast Aero. Fast Aero, a portable software, is a work in progress with the ultimate goal to provide the Aero Glass feature for all Windows XP users. The current version of Fast Aero provides the Glass effect on most - if not all - windows that are open in Windows XP. Please keep in mind that only new windows will display the Windows Aero Glass effect. Some can be minimized and maximized again while others need to be closed and reopened. The default language of the software is Polish but it can easily be changed in the config.ini to English so that the language line looks like this: language=english. The only options provided by the interface are to enable or disable the blur effect. Version 1.3 which is supposed to come out in December will offer additional features like finetuning the blur intensity and refresh interval. The Windows XP Aero Glass effect looks pretty solid in this version. 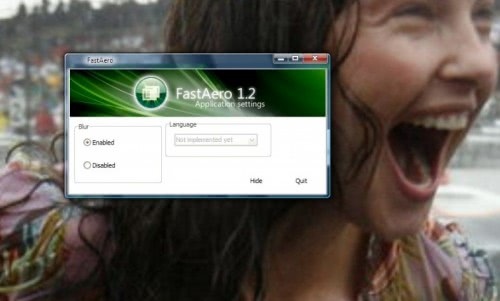 Users who like to add some special bling to their operating system will surely love Fast Aero. Other users might feel that its resource usage does not justify the visual gain. It comes down to personal choice and preference in the end. does it only do glass effect? Fast Aero is a sad try at what has already been done wonderfully by TrueTransparency. It is faster and more stable and has tons of different custom skins you can use with the it too. No I am not a developer for it however if you have Vista and are a fan of Aero then you can check out my applications (and a library if you are also developer) at http://www.tensailabs.com/. The apps and library use Aero over the entire window. More to the point though don’t waste your time. I have tried them all and TrueTTransparency is the best. It was even the only one that could do it over a remote desktop which neither Windowblinds, real Aero or any other such as the one mentioned in this article could do. Why don’t use True Transparency a.k.a TT ? it more stable and less memory usage then FastAero. This is not fake and no virus have been found its perfect. Actually, in xp, i tried border skin. pretty good, but had black squares around the corners of the window. entry regedit from Windows 7 Aero to Windows XP are better. Aero is not waste, Aero with old Design Luna.theme, Windows Classic.theme are better. entry regedit from Windows 7 Aero effects to Windows XP are better. Aero effects are not waste, Aero Effects with old single columns startmenu Design Luna.theme, Windows Classic.theme are better Design than Windows 7.